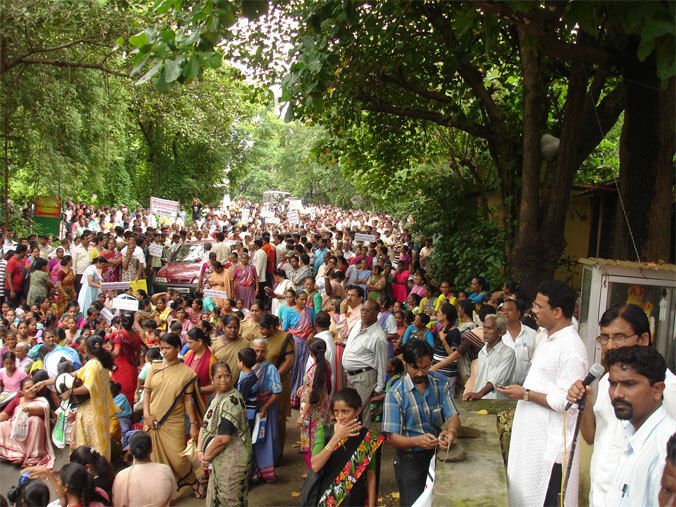 Newspaper reports indicate that the church has backed off from the agitation against the dumping ground at Uttan. it is so strange that this has been allowed to be open, despite widespread protests and health hazards. However their order got a stay in the High Court. This was not over for them that the issued show cause notices to the following as to why they should not be externed for a period of two years from Thane, Mumbai, Pune, Nasik and Raigad. The hearing was given, however the order is still not passed. On March 12, 2010, the Cardinal has asked the Church to back out from the agitation, no news why and no explanation as yet. Newspapers have made a false claim that the protectors turned violent, their version is often the "official version" the facts however are quite different. Please check the video for yourself to be well informed. WE CONDEMN POLICE ASSAULT ON PEACEFUL PROTESTERS. The situation at Dongri village near Bhayander took an ugly turn as police lathi charged and fired tear gas shells on protesters who were engaged in a peaceful dharna to stop the garbage recycling plant that is set up on a hill and has caused turmoil to the surrounding villages because of the stench that it emanates. 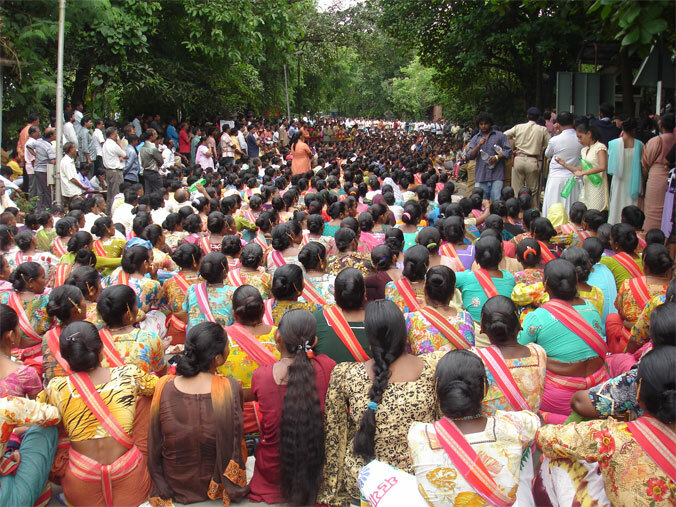 The villagers who had kept vigil on the road to stop the garbage trucks from reaching the garbage plant since the last twelve days were subjected to a brutal lathi charge by the police when they tried to stop the trucks by lying on the road. Immediately church bells were rung and thousands of villagers poured on the streets. Fifteen activists were arrested and twenty admitted in Bhagwati Hospital at Borivili for treatment of injuries. 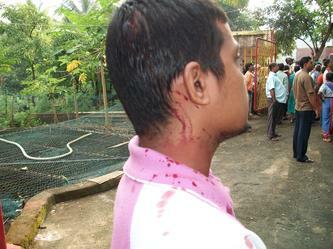 Even women and children were not spared and many received head injuries. Retired High Court Judge BG Kolse Patil who had given a call to the locals to resort to dharna and keep 24 hour vigil to stop the menace at a mammoth rally on 13th Sept 2009 at Kaka Baptista Chowk on Gorai Rd rushed to the site but was stopped at village Dongri where he has resorted to dharna on the road. 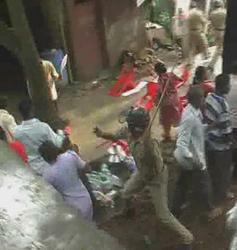 The Bombay Catholic Sabha condemns the ruthless manner in which the police have behaved to stop peaceful protesters. The perpetrators of this violence should be booked and suspended immediately. The garbage disposal plant strangely set up on top of the hill has led to pollution of well water, contamination of fields where cultivation is in progress and an unmistakable stench that is noticed in the neighbouring villages depending on the direction of the wind. The garbage recycling plant has taken away their right for clean air, uncontaminated food and a healthy life. This is an assault on their fundamental rights for a peaceful existence. Perhaps the High Court has not taken this into consideration when it asked the Government to use the help of police to clear the garbage accumulated in the Mira Bhayander Municipal Corporation. But should the wellbeing of some be at a cost of misery to others. The city fathers and the administration have messed up the project by choosing this location. On no count should the villagers be made to suffer for their folly. It is unfortunate that 17000 signatures of protests were not heeded, nor did the pollution control board take action when it was approached. The undersigned corroborates this report after undertaking a fact finding mission that consisted of a visit to the plant and a detour of the villages and participating in the protest rally against the nuisance. 1. The so-called solid waste management project (Hanjar Biotech pvt. Ltd.,) of the Mira-Bhayander Municipal Corporation should be completely stopped, scrapped and shifted permanently from the Uttan Dhavagi hill top. 2. All the activists (about 15-16) should be immediately released unconditionally. The Bombay Catholic Sabha and Spotlight is with the villagers in this hour of crises. We wish them courage to carry on with the agitation till the authorities decide to shift the recycling plant. Early morning, Sunday September 13th, the Spotlight Team descended upon Utan to witness and observe the day long dharna organized by the Civic and Political Cell of Mira Bhyander Deanery, in association with at least fourteen social organizations which included the National Association of Fishermen, The Bombay Catholic Sabha, the Bombay East Indian Association, Justice & Peace Commission, Gaothan Voice, Vasai Sangarsh Samiti, Center for Human Ecology, just to name a few. Villagers of Utan, Palkhadi, Talavli, Anandnagar, Dongri, Tarodi, Pali, Chowk, and Morva are protesting the unberable stench and havoc caused by the operators of the massive dumping grounds sitting atop the Dhavgi Hill right in the center of the nine villages. This dumping ground is set up on Collectors land which was recently transferred to the Mira Bhyander Nagarpalika who in turn has leased it for a period of 30 years to a private business operator who runs a garbage disposal company named Hanjer Biotech Private Limited. Spotlight Team visited the Dumping Grounds around 9.00 am to take stock of the activities and goings on. We met up with the site supervisor Chetanbhai to find out about how the garbage and waste is managed. The site supervisor was reluctant to speak but we persuaded him to put us in contact with the owners. He put us thru the cellphone with Naseembhai Furniturewalla who with his brother Irfan Furniturewalla run this garbage disposal company. During our conversations we learnt that this dumping ground receives about 350 tons of Garbage from the entire Mira Bhyander Municipal area. Residents of Utan feel this figure is fictitious considering the vast operating areas of the MBMC. They reckon it must be close to 800 or 1000 tons of garbage being dumped daily. We were also informed that the company segregates the waste and is able to process organic manure. From the sand and mud they are able to manufacture fuel bricks. Inert waste, they inform is dumped and they didnt say where. When we questioned them about the biohazardous and toxic waste, they seemed to be unaware of such quality of waste. When we continued to enquire further, Chetanbhai left the room, sat on his mobike and sped away leaving us alone in the office. There appeared to be around 100 workers working on the site in most unhygienic conditions There were no safety precautions, no masks, no headgear, no gloves, no safety footwear. There was no evidence of workers using H2s monitors to check out on the deadly gas as well as Norm Meters to identify Normally Occuring Radioactive Materials. We were informed that the factory had a colony on the premises where these hapless migrant workers reside. The stench at the site was unbearable to us and probably the workers were by now immune to this. The place was seething with flies and crawly creepy insects. From the hill and towards the village of Utan Pali one could easily see how the polluted effluents had trickled onto the fields which stood barren at this time of the year when sheaves of corn should be sprouting from the paddy fields. This dumping ground has been in operation for approximately 2-1/2 years now and caused innumerable health problems to the lives of residents of villages around. Miya Saeed Shah a vada paw vendor and resident of Motagao Utan stated that the stench is unbearable in the mornings and children are falling sick and the dispensaries and chemist shops in and around are making a killing . He says this dumping ground must be moved away, but the big question is How. Theres been crores of rupees spent on the project and good money exchanged between bureaucrats. 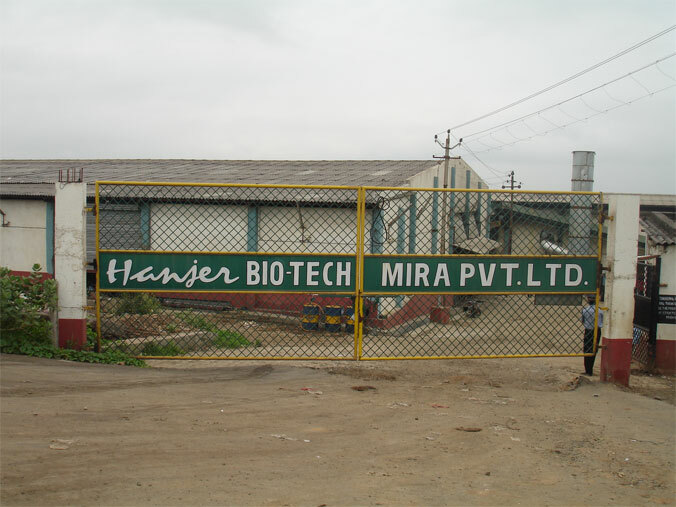 It is reported that the Pollution Control Board of Maharashtra has issued a notice to Hanjer Biotech Pvt.Ltd and thereafter turned a blind eye. Another resident Dsouza uncle states that this dumping ground is a trick played by the government. The proposed SEZ could not hatao the people of Dharavi Bet so they have now resorted to another angle. Cause people fall sick, pollute the waters so people will be harassed into moving out as they did during the great plague of the late 1800s. Local leaders James Colaco and Sunny Gadekar played anchor at the dharna, which continued throughout the day. No dump trucks or any other vehicles were allowed to pass through and, a Total Rasta Roko was enforced, from dawn to dusk. However, sick patients were allowed to pass, duly escorted by volunteers. A number of speakers kept the 4000 plus sea of humanity spellbound and listening attentively. Vilas Sonawne of the Yuva Bharat Sangathana in his own inimitable style poked fun at the MMBC administration. He compared this dumping ground project as the eight wonder of the world. A dumping ground sitting atop a hill like a flower plot whose fragrance spreads to the nine villages all around it. He jokingly tried to educate people to keep their garbage bins in their homes on the kitchen platform or dining tables instead of below the kitchen at ground level. 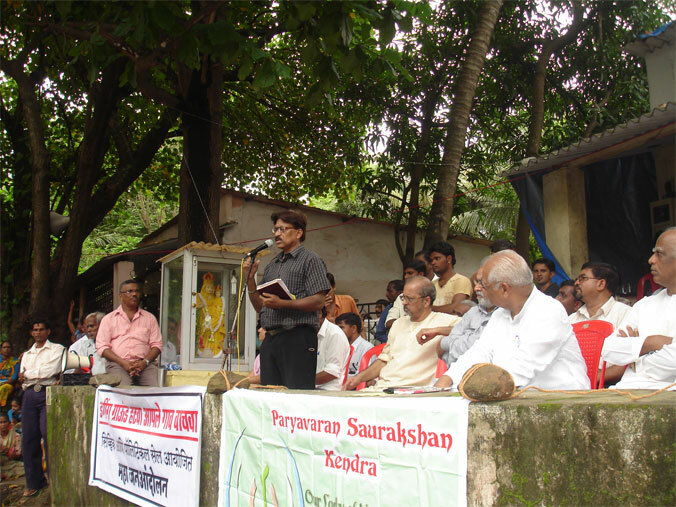 Prominent among the speakers were retired high court judge Kolse Patil and Fr. Alwyn Dsilva the dean of Mira Bhyander. There were a number of Priests and religious attending the dharna. This was complimented by a large contingent of police force with also a Fire Brigade in attendance. Fr.Victor Dalmet, famous for his performances at various East Indian Singing competitions composed and sang a song about this beautiful virgin Dhavgi hill being molested and disfigured.